Holotype of Plutonesthes crocata, copyright Larry G. Bezark. 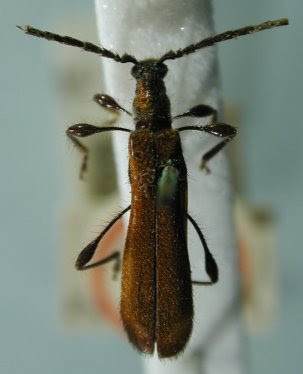 The Rhinotragini are a group of longicorn beetles that are commonly mimetic of other insects such as wasps, with the elytra medially waisted to partially expose the body at the sides. [P66] Pascoe, F. P. 1866. Catalogue of longicorn Coleoptera collected in the island of Penang by James Lamb, Esq. Part II. Proceedings of the Zoological Society of London 1866: 504–536.